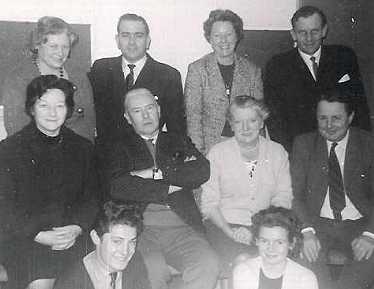 The cast of "At the Luscombe's"
This radio serial started in September 1948 and was about West Country village family life. They were created by Denis Constanduros and Michael Holloway was the storyteller. The Luscombe family included Mr. Harry Luscombe (Lewis Gedge), Mrs Flo Luscombe (Phyllis Smale), who had six children, Jack who was killed in the war, Edna who didn't appear in the series, as she lived in Rotherhyde and was married to Ron, Ted (John Bradford and later Michael Bradford) who joined his father in the business and was married to Doreen (Peggy Ryalls), Dot (Aileen Mills), son Sid (Michael Watson), and youngest daughter June (Pat Roberts). Other characters were Sid Luscombe's wife (Irene? ), Auntie Ethel (Nell Oxley) and her friend Amy Prangle, and Henry Siddon. Later came Doug Lovell (who married Dot Luscombe) played by John Hamley, also Mrs Gurd and her son Ray, Pierce Adams and Dot's friend Lorna. The producer was Brandon Acton-Bond. The first episode opened with a description of the village of Dimstock in the Wylye valley between Salisbury and Warminster, near to which Denis Constanduros lived. Most of the Luscombes lived in the village and Harry and his son Ted had their building business based there. The nearby town of Evercombe was clearly recognisable as Salisbury. Bristol made occasional appearances as Westport. Mr Luscombe had his house and yard in the Dimstock High Street, locally called 'The Street', with a peeling signboard that read 'H. 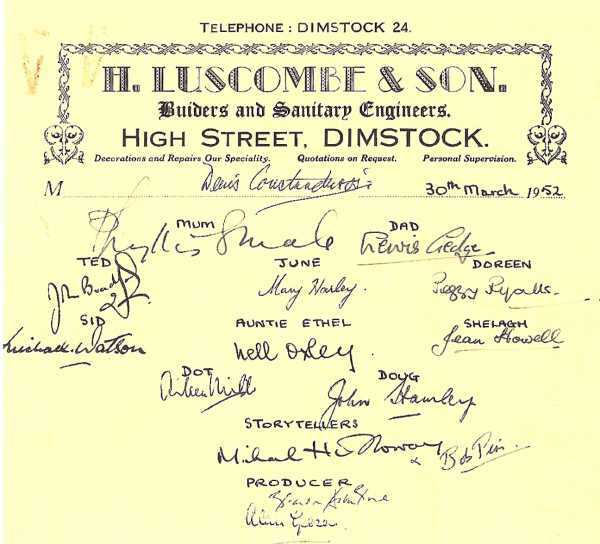 Luscombe and Son , Builders and Sanitary Engineers'. Mr. Luscombe was always too busy to repaint his own signboard. In the first episode we are introduced to the family on Mrs. Luscombe's birthday. Ted and Doreen are expecting their first baby and Doreen is being too independent for Mrs. Luscombe's liking, as she likes to be 'in charge'. Sid, the slightly 'tearaway' son, who wouldn't join the family business, works in a garage and is trying to borrow yet more money to start a swing band. Dot is slightly ashamed of the shabby house with the washing in the kitchen, as it's a wet afternoon, and her smart friend Freda Walker (played by Sonia Berkavitch), is expected for tea. Auntie Ethel is also coming, an elderly lady suffering (and complaining) all the time about her indigestion. June, the youngest, is still at school and going to college as Mr. Luscombe has set his heart on her becoming a teacher. The series wnt out every Saturday night at 7:40pm for twenty minutes, with the new series starting in October each year. Listeners were soon familiar with all the comings and goings of the family and their mannerisms and expressions. Auntie Ethel always said "Cooee! Anyone at 'ome?" and Mr. Luscombe never swore but said 'Cor, dash my buttons, Flo.' or 'Cor, lumme Charlie'. Mrs. Luscombe would ask Harry to 'Make a long arm for the teapot,' and when asked if something was correct, said 'As true as I stand here with the teapot (or whatever she was holding at the time) in my hand!!!' She also said 'Well, you know best' in a certain tone of voice, when her judgement was questioned, when she obviously thought that you didn't!!! Signature tune - "Dickon o' Devon"
By 1964, 1000 episodes later, Dad L was being played by William Robinson after the death of Lewis Gedge, June by Mary Hartley, and the storyteller was Robert Pim. Patrick Dromgool took over as producer. Harry Luscombe's dog was called "Queenie" and lived in the yard and Harry would call the dog which caused Mrs Luscombe much consternation because it was also the name of the next door neighbour, Mrs Queenie Slater, a woman of whom Mrs Luscombe did not appprove, being a bit "flighty" ! A phrase which sticks in my mind was Mrs. Luscombe saying "Make a long arm for the lardy cake, Dotty dear!" I believe Sid's wife's name was Sheila of whom Flo did not fully approve because she was a bit work shy about the home. I have just looked at your website piece about the series 'At the Luscombes' which was broadcast on the radio from 1948 until 1964. I had no idea that it had had such a long run!. I fondly remember listening to the programme with my mother when I was a child. She was a keen fan of the programme and we looked forward to listening to it on Saturday evenings following the football results, and before 'In Town Tonight'. In those days radio was our main form of entertainment and Saturday evenings were great listening, as we sat in our kitchen with its linoleum covered floor, on hard chairs in front of the old fashioned black iron range with our black and white cat for company. I also remember several characters who were not mentioned in your piece although I'm not sure they all featured in person in the series. One was Arthur Crouch with whom Dot had an on/off relationship. Arthur Crouch's father had a farm and Mr Luscombe and Ted frequently carried out work at the farm. Septic tanks seemed to feature prominently, I recall as I can remember asking my mother what a septic tank was. Another was Ruby Pritchard who was by all accounts bold and flighty and rode a bicycle wearing very short shorts and then there was Perce Adams who was Auntie Ethel's lodger and who was a bit of a ladies man sparking a certain amount of rivalry between Auntie Ethel and that great gossip Amy Prangle who had a very distinctive voice. Auntie Nance was sometimes mentioned as a visitor but didn't appear personally. It is now nearly ten years since listeners in the West first became aware of Dimstock and the Luscombes, and much has happened in that time. Those with very long memories may recall that, on their first meeting with the family, Mrs. Luscombe was dragged out of bed in the middle of the night by an anxious Ted, to await the arrival into the world of her first grandchild. Now they have altogether eight grandchildren, including Sid and Shelagh's adopted child; and though Mrs. Luscombe feels it is not a subject that can very well be talked about in public, she has by no means given up hope that the number will one day be increased. Apart from John Malcolm, whose arrival co-incided with the introduction of the family on the air and who has now grown out of his first childish comics and prefers bloodcurdling Westerns, the ten years have probably made most difference to Dot. From a well-meaning but rather tiresome girl, with not very much in her head but what she was going to wear at the next dance, she has become a fairly responsible wife and mother and quite a prop to her parents. But of course even he would be the first to admit that by far the most important person in the household is his wife: and it is no good asking her how she feels because she is generally too busy to think about such things. But some of the family are occasionally worried by the fact that when she has got too much to do, which is nearly always, she gets more than usually flustered and confused. But, if anyone is unwise enough to mention the fact, she is inclined to take it the wrong way. Though in many ways she has a heart of gold she certainly is not the easiest of people to get on with, as Dot's friend, Lorna, could tell you. But I am sure of one thing: even in another ten years' time she will not have altered in spirit; she will be just as passionately wrapped up in the affairs of her family, and just as fiercely partisan on their behalf to her last breath.